It just goes to show how the logic of the mind works in the younger memebers of our society. We get so jaded and so "linear" as we grow up I guess we think were being logical. But kids see the world in a differnt way no less logical and frankly sometimes it makes more sense. I remember when I was about six I was given an IQ test they were worried about me (mainly I think becuase was Chinese - they'd never really come across anyone like me before) I had to place in order a family of elephants there was a Mum, Dad, Grandmother and baby elephant. So I put the Mum first, Dad second, baby next and then the Grandmother. This apprently was really worrying for them becuase I hadn't done it "sequentially" i.e. Dad, Mum, Grandmother and then baby - though I'd dispute that that'ssequential! For a few weeks after that I remember being studed very closely at school for any other signs of mental abnormailty! I placed the elephants in an order that refelcted my life - in that I was always placed inbetween my dad and grandmother when walking down the street (probably for staftey reasons was kept away from the edge of the pavement and the potential hazard of traffic). I'm sure that your little one will be fine. Aw...its amazing what children think isn't it about themselves and their family. I like how she put herself right between her parents. She's such an intelligent little girl. Of course being the youngest means competing for her parents' love with her siblings. That is fascinating! I would have never thought about that either. Children are so amazing with their thought process and ideas. So smart of her to put the sticker there to represent herself. It is a prove that children are indeed very smart and sensitive..Things which mean nothing to us might be so valuable to them. Yesterday, my daughter couldnt find one of her favourite soft toys. I told her not to worry cause I am going to buy a new one. She said she doesnt want a new one and was crying so badly. So we ended spending hours looking for this soft toy! Aww!! Poor thing!! But, how sweet of her to check on that everyday! Sometimes grown-ups forget what small little things mean to young children. Like my nephew's soft stuffed rhino was "taken away" from him to make him grow up. I don't understand. Children own toys as part of growing up. How can one take away a child's toy to "force" him to grow up? He was made to believe that rhino went missing. He almost teared in his eyes when he told my sis about that missing rhino. poor little muffin!! well, all i can say is you'd better find another monkey sticker on the double ;-) Give her lots of love and special time this week! Oh dear, I hope your little girl is feeling better now. 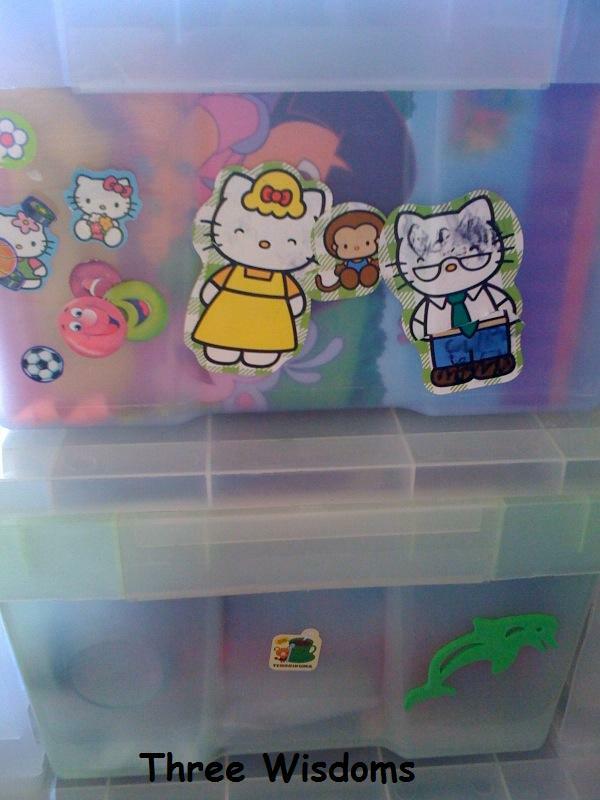 I never though about this, my elder boy has many stickers in his bedroom drawer too just like your daughter! I never touch them so far but I shall be more careful next time if I wanted to remove them! @Buckeroo - No idea what is "keh Po". I tried many different phonics to get it but no luck. My kids put sticker every where too..Sometimes, it made such a big mess on the wall..